Hurricane Alex made landfall as a Category 2 storm along the Gulf of Mexico’s coastline in northern Mexico, very close to the border with Texas. Neighboring states’ residents had their worst fears confirmed as the powerful storm managed to push thick crude oil onto nearby beaches; kicked up by the high waves Alex has whipped up along most of the Gulf coast. Heavy rains and maximum winds of 110 mph slammed into Mexico’s northern Tamaulipas state; approximately 110 miles south of Brownsville, Texas. Residents in the Mexican fishing villages and marketplaces packed onto buses to move inland in the hopes of dodging Alex’s potentially deadly wrath. Emergency shelters have been set up at several locations in San Fernando. At least 3 people have been killed by Alex’s furry in Mexico. No reports of deaths in the United States so far. Alex’s fierce rotation spawned at least two tornadoes near Brownsville, TX. One tornado is being blamed for flipping over a trailer and causing other damage nearby. 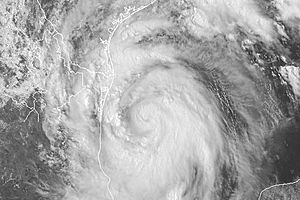 The National Weather Service downgraded its storm warning for the Texas coast from hurricane to tropical storm strength. The Gulf coast has been feeling the effects of Alex’s outer bands for hours. Two tornadoes were reported near Brownsville, Texas. No immediate report of injuries but damage reports are coming in from around that area. The river level is rising near the Arroyo Colorado river. It appears a tornado touched down in the San Pedro community. A water station flipped over, a semi-trailer tipped over and tree limbs are scattered everywhere. 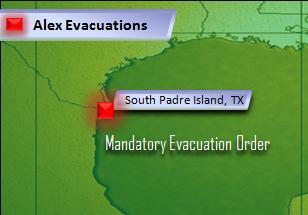 Mandatory evacuations tonight in Cameron County, Texas, southward to the nearby South Padre Island as Hurricane Alex continues to gain strength in the Gulf of Mexico. 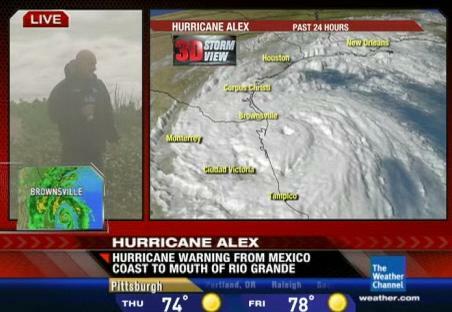 As we’ve been telling you, Alex is taking aim at the coastal areas of south Texas, near the border with Mexico. 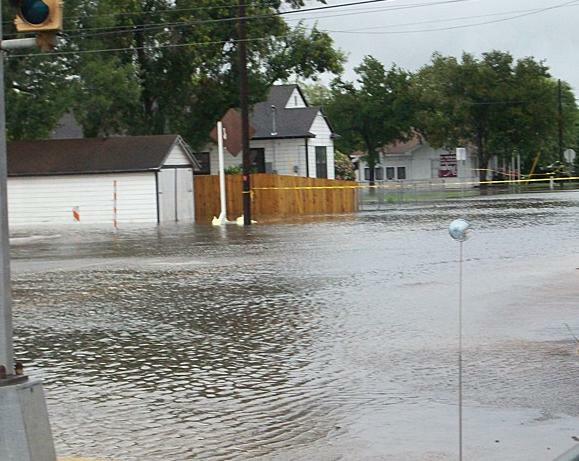 Officials in southern Texas have been preparing throughout the day for Alex’s arrival. They’ve readied rescue vehicles set up emergency shelters in San Antonio and Laredo. Tourists on South Padre Island left the white sand beaches and heeded official’s evacuation warnings to get out of town. Hotels and restaurants, usually packed this time of year, have been deserted with very few wanting to tempt the wrath of the year’s first Atlantic hurricane. Dr. Michio Kaku, host of TV’s “Sci-Fi Science” says “oil spray” could cause negative health effects for many Gulf coast residents during an interview on MSNBC Wednesday afternoon. Those who have lived through a hurricane know the mist, or spray, that fills the air from the water being blown onshore at upwards of 100 MPH or more. Kaku believes that spray will contain crude oil particles which could be harmful if inhaled. In 1999, researcher Craig F. Stead submitted a study to the CDC Conference on the Health Impacts of Chemical Exposures during the Gulf war. That study was talking about a much higher rate of exposure than would be experienced in a weather event like Hurricane Alex. Stead’s study shows even petroleum exposure on a smaller scale can cause life threatening symptoms. Stead’s study indicates petroleum exposure presented symptoms such as “fatigue, breathlessness, cough, skin rash, headache, diarrhea, and memory loss.” In extreme cases, it can also cause cancer, according to Stead. He also thinks tar balls, the size of apples could be “launched through the air in people’s yards, pools, and streets” in the storm’s fierce winds. may be a worst-case scenario, but, at the very least, Alex will come as a dress rehearsal for future hurricanes this season. Either way, it’s just another concern for residents already devastated by the effects of the BP oil spill; which seems to be getting worse every day.